Rusty, a 5 month old mini red-tri. What a smart dog. He is a real challenge though. Into every thing all the time. 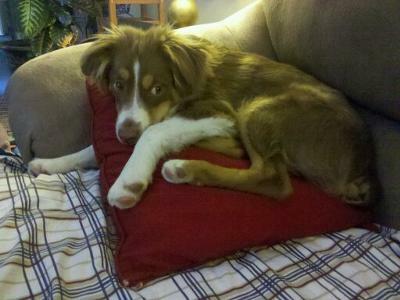 I have previously had other herding dogs, but nothing like this little guy. He is fortunate he has the opportunity to go to the farm with dad most days. He eats everything (things not so good ) and runs like he's on fire all the time. So far he can sit, lay, come, heal, and fetch tennis balls… Working up to frisbee fun some day. So far so good, but some days I am pulling my hair out. Good luck to all you other Aussie owners. On those tuff days remember all things are as they should be. I really do believe you get out what you put in.